Chief Executive Officer of the National Youth Authority, Mr. Emmanuel Sin-yet Asigri has advised the youth of Ghana to be moderate, decorous and prudent during this year’s Valentine’s Day celebrations. In a solidarity statement to extend his profound greetings to the youth in reveling the day which falls on the 14th of February each year, Mr. Asigri went on to advise the youth to focus on the real essence of the day which fundamentally is to spread and show love and to refrain from all manner of excesses and negative inclinations. He said the campaign against drugs and substance abuse notably tramadol, which the Authority launched in August 2018, remains in earnest and called on the media to join hands with the Authority in the effort to address the danger. “I wish to commend the EIB network for their partnership in the campaign and would like to appeal to other media outlets to also join the NYA in this well intentioned pursuit to end the scourge of tramadol abuse and to aid equip our youth to become responsible citizens armed to contribute their quota to the nation’s building and development exercise” Mr. Asigri stated. Mr. Asigri further advised the youth to patronize domestic products such as the ‘Golden Tree’ chocolates especially during such festive occasions in a bid to help promote the cocoa industry and the local economy as a whole. He mentioned the health benefits of cocoa as possessing anti-oxidants that help reduce blood pressure, delay ageing and fight tooth decay, amongst others. 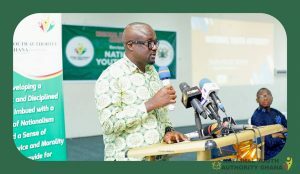 The C.E.O reiterated the NYA’s preparedness and resolve to collaborate with stakeholders to uphold and consolidate the core obligations of the Authority which remains to Promote in the youth a sense of self-reliance, leadership, discipline and civic responsibility and to ensure the total development and empowerment of the Ghanaian youth for their meaningful participation in the development of the country. “I remain upbeat about the youth development agenda. My tenure as CEO of the NYA has offered me a rare opportunity to meet and interact with Ghanaian youth across the spectrum especially during the recently organized youth volunteer work camps held across the nation and the stakeholder engagements towards the review of the 2010 National Youth Policy which has come to an end and I can say without equivocation, that I am placed in a unique position to appreciate the situation of our youth and we shall continue to work hard to ensure their overall wellbeing” Mr. Asigri asserted.